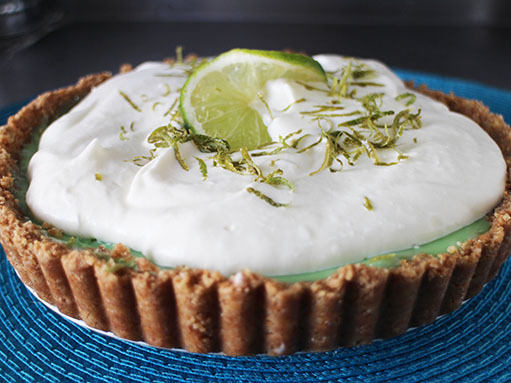 Key lime pie is very well known, but many people are unsure about what 'key lime' refers to. Well, key limes are tiny limes that grow in Florida (the name probably comes from the Florida Keys). But don't worry if you can't get them, normal limes will do fine, and most people can't tell the difference. This recipe makes enough for a pie baked in a 22cm (9 inch) diameter tin. Use a tin with a removable bottom - it will make your life a lot easier. First of all, you need to smash your biscuits into crumbs. You can do this using a food processor or a blender, or put the biscuits into a plastic bag and smash them up with a rolling pin. Melt the butter and stir it into the crumbs. Mix until well combined and then take a handful and squeeze it. If the crumbs hold together, that's fine, otherwise add a bit more melted butter. Grease the inside of your tin with butter, and spread most of the crumbs in an even layer on the bottom. The crumbs need to be compressed to make them hold together - I do this by pressing down on them with a potato masher. Now press the remaining crumbs up against the inside edge of the tin to form a rim. Again, you'll need to press the biscuit crumbs quite firmly to make them hold together. Put the 'pie crust' into the fridge for at least half an hour. You might want to cut some whole slices from one of your limes to use as decoration. Remove the zest from all the limes, and then juice them. If you watch the accompanying video, you'll see a nifty trick for easily extracting as much juice as possible from your limes. Beat the egg yolks together in a large bowl. Stir in the condensed milk, mix well, and then add the lime juice and half of the zest. Stir until thoroughly mixed. Preheat your oven to 160°C (320°F). Take the pie crust out of the fridge and spoon the filling into it. Bake for 15 minutes then allow to cool completely - the fridge or freezer will speed this up somewhat. Beat the cream in a bowl until it begins to thicken. Add the sugar and beat some more. Spoon or pipe the topping onto the pie, sprinkle with lime zest, and add one or two slices of lime. The video above is from the Keef Cooks YouTube channel. Click here to see the video recipe of Key Lime Pie on YouTube. If you can't get digestive biscuits, graham crackers are a good substitute. Total time: 1 hour 35 minutes.